Who put the vegetables on the grill? Summer is coming, the charcoal is glowing—it’s grill season! Normally, this time of the year is dominated by meat. Is it even possible to have a satisfying barbecue without it? Of course it is! 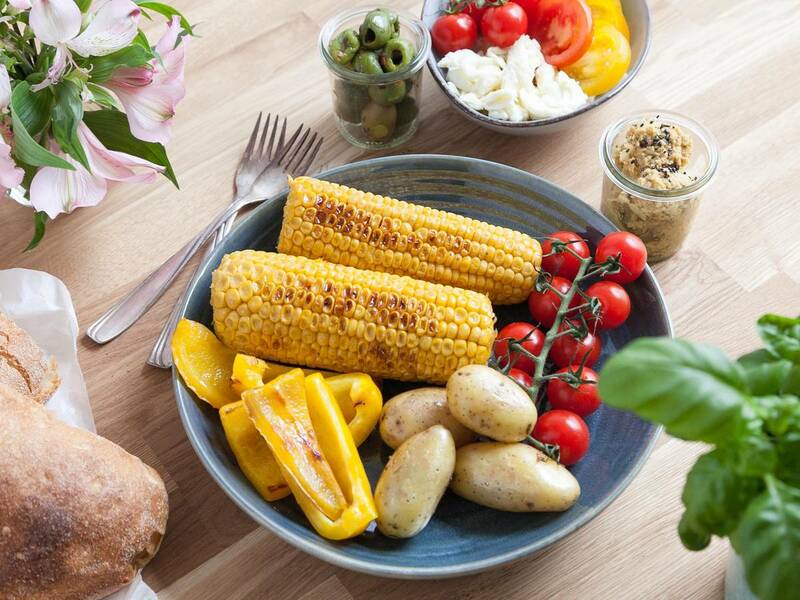 What is a barbecue party without delicious dips, fresh salads, and grilled vegetables? So, let’s skip the meat for once and focus on the beauty of grilled veggies. Here are our 6 favorite vegetarian barbecue recipes from salad to dessert—simple, fast, and refined! The Main Event: Make this side the heart of your party. There are no limits to creating your vegetable plate—bell peppers, eggplant, onions—even fruit—are delicious when grilled. Have you tried grilled melon yet? The Classic: Almost everyone has already tried grilled corn. That’s reason enough to surprise your guests with a special topping. The miso paste and chili makes this flavored butter spicy and addictive. Don’t forget the cheese: Not only vegetables should be grilled, but also cheese, like Camembert, which gets even more flavor when dressed with herbs. Don’t forget to pack it well so that nothing drips onto the grill. Together with a crunchy garlic baguette, you can be sure that there will be nothing left at the end of the barbecue. The Salad: Salads are the perfect dish to be prepared ahead of time. Plus, they bring a certain freshness to your plate. Want to have more than chickpea or tomato salad? Grill the salad components next time! In this recipe, the corn is grilled first, then turned into a light but hearty salad. The Dip: Instead of standard sauces like ketchup and mustard, score big with a homemade dip. This dip is perfect for everyone who is already bored by hummus and wants to make the best of chickpeas. The Dessert: Who said desserts and barbecue don’t go together? Treat your guests to an unexpected sweet ending with a freshly grilled banana, paired with everyone’s favorite—chocolate. Which vegetables dishes do you like to grill? Tell us in the comments (and show us your best barbecue pictures, too! ).